The El Niño-Southern Oscillation (ENSO) is the most important driver of natural climate variability and is characterized by anomalies in the sea surface temperatures (SST) over the tropical Pacific Ocean. It has three phases: neutral, a warming phase or El Niño, and a cooling phase called La Niña. In this research, we modeled the climate under the three phases as a network and characterized its properties. We utilized the National Center for Environmental Prediction/National Center for Atmospheric Research (NCEP/NCAR) daily surface temperature reanalysis data from January 1950 to December 2016. A network associated to a month was created using the temperature spanning from the previous month to the succeeding month, for a total of three months worth of data for each network. Each site of the included data was a potential node in the network and the existence of links were determined by the strength of their relationship, which was based on mutual information. Interestingly, we found that climate networks exhibit small-world properties and these are found to be more prominent from October to April, coinciding with observations that El Niño occurrences peak from December to March. During these months, the temperature of a relatively large part of the Pacific Ocean and its surrounding areas increase and the anomaly values become synchronized. This synchronization in the temperature anomalies forms links around the Pacific, increasing the clustering in the region and in effect, that of the entire network. Marissa Pastor is currently the Chair of the Department of Physics of the University of San Carlos in Cebu City. She completed her undergraduate and graduate studies in Physics at the National Institute of Physics of the University of the Philippines Diliman. She has taught university physics at the University of the Philippines Diliman, Ateneo de Manila University, and Miriam College. From 2012 to 2015 she worked as a post-doctoral fellow at the Asia Pacific Center for Theoretical Physics (APCTP) in South Korea under the APCTP Young Scientist Training Program. Her passion includes studying the Korean language so that accepting a post-doctoral position in South Korea was a good opportunity to pursue two interests at the same time--language and research. Her research revolves around various topics in complex systems such as stability, mixing and segregation of granular materials, intracellular transport of particles, and earthquake and climate networks. After finishing her post-doctoral fellowship, she went to the Visayas Region to explore the possibilities of doing research and teaching at the University of San Carlos. M. Pastor. 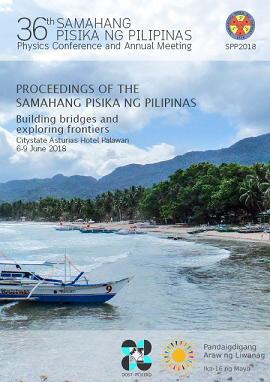 Analysis of the structure of climate networks under El Niño and La Niña conditions, Proceedings of the Samahang Pisika ng Pilipinas 36, SPP-2018-INV-3D-01 (2018). URL: https://paperview.spp-online.org/proceedings/article/view/SPP-2018-INV-3D-01.